Several times over the years we have gone to a presentation our local library does related to Chinese New Year, where they talk about the traditions and have traditional dancers (and a dragon). 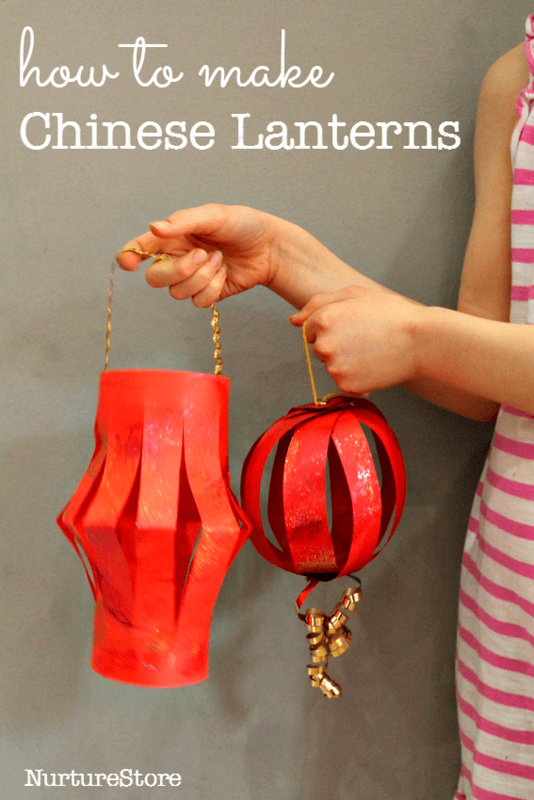 A classic kid craft for Chinese New Year is making paper lanterns. They are made from red paper because red scares the dragon away. I like this spin on Chinese lanterns from NurtureStore, where they used sparkly paint to decorate them and did a couple of different construction methods. While you’re checking that tutorial out, make sure you don’t miss Cathy’s other great content for Chinese New Year including sensory writing, a few different dragon crafts, counting in Chinese and more. So much fun! Do you celebrate Chinese New Year or do anything special for it with your kids? I’d love to hear about it! It’s the year of the rooster so I’ll have to pull together some rooster crafts soon.